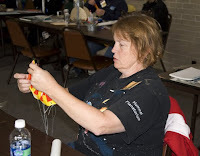 My co-worker, Renee and I, along with 14 other teachers, attended a day-long rocketry workshop at the American Museum of Science and Energy today. It was put on by fac ilitators from the NASA Marshall Space Flight Center in Huntsville, AL. We made water-powered rockets from 2-liter soda bottles, a straw and a balloon on a string, film canisters with effervescent tablets, and then finally, small model rockets. Some teachers got quite creative in their decorations; these 2 teachers want NASA to paint polka-dots on the next rockets! Hmm, I wonder what the Russians would think about that!? After we got the rockets put together we had to pack the pa rachutes. We loaded an egg as "payload" in the nosecone of our rockets. 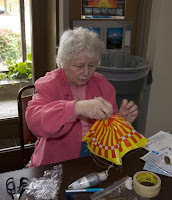 Some people used bubble wrap, plastic, parts of the egg cartons, paper towels, etc. I decided to try sodium polyacrylate gel in mine. You can see one of the nose cones in the photo on the left. Later we got to go outside and try out our r ockets. It was quite breezy, so we had a little difficulty launching them at times. 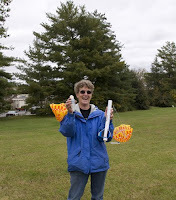 Renee was one of the first people to launch her rocket, a stiff breeze blew up and her rocket landed in a tree! Most people had successful launches, no one had a launch pad failure. 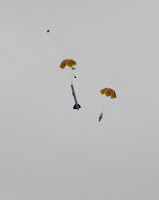 When the rocket motors burned to a certain point they shot out a second time and released the parachutes (see photo below). Na turally, by using the gel, I had the heaviest payload, so my poor rocket barely got high enough to release the parachutes. But the gel did the trick and my egg did not break! It was a fun day and we learned a lot. Teachers enjoy getting a chance to be "students" too! I hope we can do the rocket activities at science camp next summer! As much as I enjoy hiking with Kenny and my friends, sometimes I like to go out on my own so I can take my time photographing. 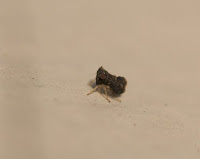 If I want to spend 30 minutes taking photographs of slime mold, I can without feeling guilty! 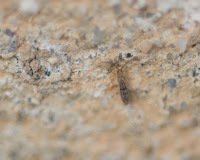 :) Today I went on a "macro" hike. No, I didn't put in 20 miles, in fact, I probably got in only 2 or 3 (with ~25 pounds of equipment on my back, I didn't want to walk too far!). Today I wanted to try out my new "toys." When I had to replace my camer a last week, I ordered extension tubes too. I was anxious to try them out, so I headed to Haw Ridge. 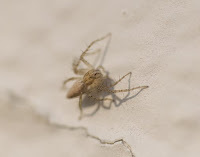 Most of the day I shot just using my 105mm macro lens and a 36mm extension tube. 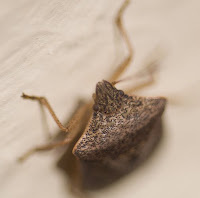 I was amazed at the difference ad ding the extension tube made! 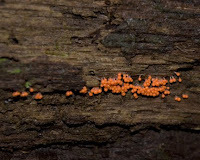 Here is an orange slime mold that I photographed using it. I enjoyed seeing the detail in these pretty little fungi. It was fun to look for tiny plants, fungi and insects to photograph. There are so many amazing things around us that we miss because we are in too big of a hurry or not observant enough to notice them. 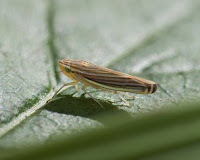 I was glad this little leafhopper (right) was c ooperative with me! I noticed something red moving on the bark of a tree trunk. 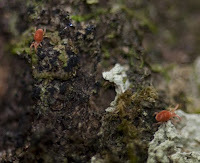 They were tiny red Velvet Mites that were about 1 mm. 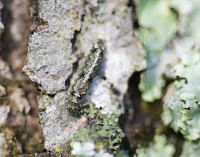 There were some ants running up and down the tree too, but it was difficult to keep them in focus. 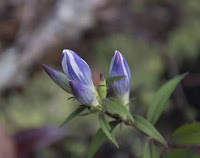 Most of the wildflowers are gone now, but there were a few asters, go ldenrods and some Stiff Gentian in bloom. I was excited to photograp this green, metallic bee on an aster flower in th is photo. Notice the interesting eyes this bee has (click on the photo to enlarge it). I hadn't seen Stiff Gentian (Gentianella quinquefolia) in several years, but today I saw many plants blooming up on the ridge. On Sunday (I'm a little behind getting this posted!) I went to the Cherokee National Forest and Cherohala Skyway with my friend s, Charlie and Roseanne. Our first stop was Conasauga Falls in the National Forest. 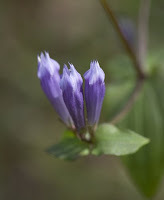 As we were driving along the gravel road back to the falls, I spotted an unusual wildflower. Fortunately, Charlie likes wildflowers too, so he was more than willing to stop. It was a Striped Gentian (Gentiana villosa). The waterfall was a moderate 1-mile from the parking area. On t he way down we enjoyed seeing the beautiful colo rs of the fall leaves. The Sassafras, Sourwood, and Red Maples were especially bright. We saw several mushrooms and different lichens and fungi along the way too. I was glad this mushroom survived their 2 dogs, Tootsie and Peanut. Tootsie gets excited about hiking and tears down the trail! It was a bit tricky getting down to the waterfall because the bank was very steep. I'm still a bit leery to have my camera around water after last weekend's disaster! I was very careful and stayed away from any slick rocks. This was my first trip to Conasauga Falls (left), thanks to all the recent rains the water level was pretty high. It made for some nice photography. Our next trip was to Bald River Falls. It was the highest level I had ever seen the river. The kayakers were having a great day! We stopped along the road several times to photograph the river and the kayakers. Bald River Falls was roaring! It was the best I'd ever seen. The last time Kenny and I came down to see it, p eople were climbing on the rocks in the middle of the falls, that wouldn't have been possible this time! We didn't have a lot of time at the falls because we hadn't had lunch, our stomachs were growling and we still wanted to get to the Cherohala Skyw ay before sunset. As we drove up the gravel road to the top we stopped a few times to get photographs of the stream. I especially liked this shot. I don't know if this pretty little waterfall has a name or not, but I called it Split Falls. We were in for a nice surprise when we got to the to p. There had been a snowfall and some freezing rain overnight that turned the high elevations into a winter wonderland. 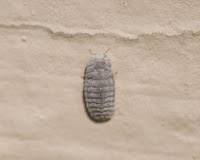 Quite a surprise in October! The best view was about 1000 feet higher into North Carolina, it was completely white! Our last stop was at one of the overlooks to watch the sunset. Brrr, it was cold up there!